On the Road..... and Then...? : WoW! We’ ve got HDTV! WoW! We’ ve got HDTV! Remember the RCA color TV ads from the 60s? “Wow, We’ve got Color TV!”? Color media sources are so common today that it is hard to imagine watching shows in black and white that should have been in vivid color, like Howdy Doody, Sure, Clarabelle finally made it into full living color before the show was cancelled but I don’t think that kids really noticed the lack of color…. until it started being viewable in full color on their home TVs. High Definition TV is much like this. What one comes to accept as normal may be really substandard to many others. Sure, I go and stand in CompUSA or BestBuy and try not to drool like a fool as I slowly cruise through the TV departments. Mer, on the other hand, has really not had the exposure or even the interest in the difference between HDTV and anything else. Heck, she grew up without TV at all (or mostly… it was a Dad thing). After only a few minutes of watching this new one she is wondering how we ever enjoyed watching anything in non-HD. As it is with many things it has to be experienced to be appreciated. 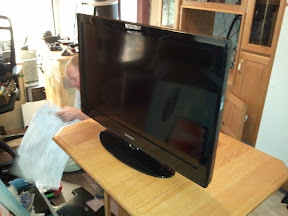 Well, our generous kids puddled their Christmas gift funds for us and presented us with a Samsung 32” HDTV and nifty wall mount to hang it on. Since we are not planning to be back here for Christmas they felt we should have it “professionally” installed (by EmeryIII) before we left. He put it in on Saturday and it is excellent! The installation involved removing all the old electronics center equipment and the 27” CRT tv from 1999. That was a four-handed two-person job! Since we mostly watch the TV from our recliners, we wanted it much higher so our creaky old necks don’t have to get kinks from tucking our chins to watch it over our noses. 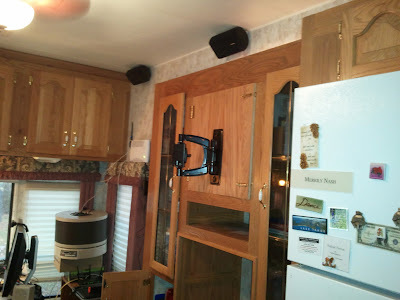 We finally figured out that it could be mounted where the entertainment components had been in the upper cabinet and those could be relocated where the old TV had been. 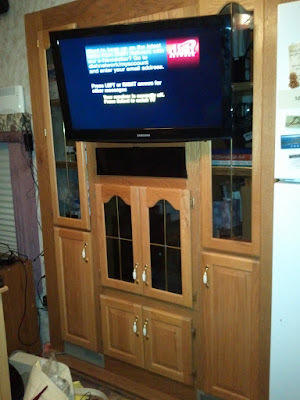 EmeryIII removed the old smoked glass doors and crafted a tight fitting swing out panel to attach the HDTV mounting bracket to. Now, we have full access to all that space that the old CRT TV took up. One big concern I had in trying to plan to put in a larger TV was the overlap with the cabinet doors to either side of it. 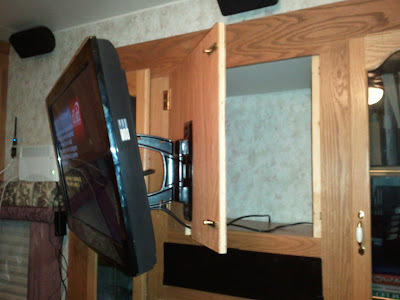 The TV mount that Emery found is made to swivel in 3 dimensions so it easily shifts to either side to clear the doors when they need to be opened. The vertical tilt it allows makes it a perfect viewing angle from our reclined positions. For the first time, Merrily can see TV straight-on from her chair and we can actually watch TV while eating at the dining table (not that this is necessarily a good thing). We have such great kids and the installation job that EmeryIII did is truly professional in every way. Thanks guys and a special thank you to Emery for spending his Saturday doing this right for us. We are truly blessed beyond our rights. Great TV and nice job on the installation. HD is sure the way to go! You look to have the same type swivel mount that we have in our rig - it's a perfect gizmo for adjusting to the right angle. Gobbled the Gobbler… now what?